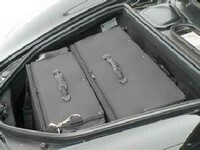 Bespoke custom made luggage for Ferrari F430 and Ferrari 360Modena. "Wow - what truly amazing service !!! I only ordered the car cover yesterday and I rang you this morning as I realised no-one would be home to take delivery so I asked if the parcel could be delivered to me at work and it has just arrived !! What a brilliant company ! Thanks."